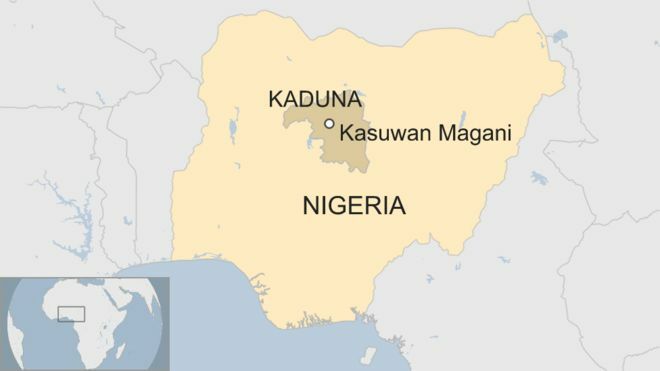 Sectarian violence sparked by a spat at a market has left 55 people dead in Nigeria's northern Kaduna state, President Muhammadu Buhari has said. Muslim and Christian youths reportedly clashed after a row between wheelbarrow porters in the town of Kasuwan Magani. The state police commissioner said 22 people were arrested after the unrest. Authorities also imposed a round-the-clock curfew in the town. Nigeria often sees outbreaks of sectarian violence. Official presidential spokesperson Garba Shehu tweeted that Mr Buhari found the country's frequent use of violence in such disputes "worrisome". Without harmony between different groups, "our everyday businesses would be impossible to achieve," the president said.